With a life that spanned times of war and times of peace, times of plenty and times of want, Charles “Charlie” Clark was a fun-loving and spirited man who brought the world around him to life. He was a man of honor who was well respected and always full of timeless advice. Charlie took his roles as a husband and father to heart, but he just may have argued that nothing was better than being a grandfather, great-grandfather, and great-great-grandfather. Life will never be the same without him here, but he leaves behind a timeless legacy that his loved ones will proudly carry on in his footsteps. The 1920s were an exciting time in American history when countless advancements were transforming the way we lived our everyday lives. Jazz music and ballroom dancing was popular while radios forever changed our ability to see beyond ourselves. 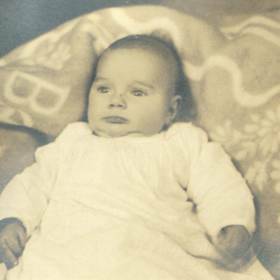 Amidst this exciting time was a time of great excitement in the lives of Bracy and Lucretia (Troyer) Clark as they were pleased to announce the birth of the baby boy they named Charles H. on October 31, 1926, in Akron, Ohio. He was the oldest of eight children as he was raised in the family home alongside his bothers and sisters. Charlie’s father was a farmer on his own land after previously working for Good Year Tire in Akron. His mother had more than enough to keep her busy at home. In many ways Charlie experienced an upbringing that was fairly typical for the youth of his generation. He was described as a good kid who helped care for his younger siblings as he was always the kind of person who enjoyed helping others in any way he could. Charlie was his Uncle Loren’s favorite nephew, and it was a day to remember when his uncle took him to get his driver’s license. As the harsh days of the Great Depression of the 1930s hit, the Clark family kept food on the table by eating potatoes that they grew in their garden. Charlie hated being sent to pick the potatoes, however, and since he refused to touch them with his hands he picked them by stabbing them with a fork. His mother always used to ask him why there were holes in the potatoes. 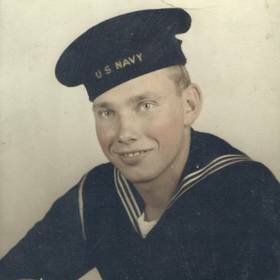 Charlie attended local schools, and after graduating from high school in Akron he enlisted in the Navy. He was sent to the Philippines during WWII and served for six years altogether. New and exciting changes were in store for Charlie when he met the young woman of his dreams. Her name was Norma, and it was love at first sight for him. With a desire to establish a life together, Charlie and his sweetheart went to Kentucky and got married. He only had $3 in his pocket, but he paid a pastor a quarter to marry them, and they found a stranger on the street who was willing to be a witness. They exchanged their vows on September 16, 1947, in Elizabethtown, Kentucky, marking a new chapter in a love story that would span 63 years. They moved to a home on Nobel Avenue in Hamilton, Ohio, where they remained for three years until building a home in the country. Together they welcomed five girls including Norma Jean, Shirley Ann, Charlene Hope, Pamela Faye, and Janice Darlene into their hearts and home. Charlie and Norma exemplified what marriage is truly intended to be as they were soul mates, companions, and best friends. Charlie often sang “You Are My Sunshine” to Norma and affectionately referred to her as Stormy among other nicknames. She often called Charlie “Mr. C H Clark.” To support his family, he made a career at General Motors. Charlie started there in his early twenties as a supervisor of tool making and retired in 1992 after 45 years of dedicated service. Always one to be busy, Charlie was a man of many interests. He was a huge animal lover who never wanted to see any animal suffer due to not being fed, which leads to overweight animals. Over the years they had cows, dogs, and pigs, but his favorite was their dog named Tippy who was the best listener and able to follow commands. Tippy was a faithful companion and a faithful friend. Charlie loved going on vacation. When his girls were young they enjoyed camping with their friends, Barb and Bill, and they also enjoyed a trip to Myrtle Beach - although Charlie did come down with sun poisoning. They also went to Niagara Falls and he went out West with Norma. Charlie loved having company over, although everyone knew not to let him cook unless it was his potato salad or his punch since he once put salt in his daughters’ oatmeal! Charlie did enjoy good food including the slam burgers his wife made that were only complete with tomato and lettuce. He also had to have fried potatoes. When relaxing, Charlie liked shows like Hee Haw, Walker Texas Ranger, Bonanza, Gunsmoke, and Blue Bloods, which he watched with his granddaughter, Susie, every Tuesday and Friday. He cherished his role as a grandfather, and he was an active part of his grandchildren’s lives. Charlie loved having them over, and it was a tradition that family always came to his house for Christmas. They also played Connect Four on Christmas Eve. A man who was loved and respected by countless others, Charles Clark was truly extraordinary. He was the patriarch of his family and was so proud of his family tree, and it has been said that he was the best husband, father, and grandfather around. Charlie could be such a jokester and was always happy, which is perhaps what made him such a great Santa. With his quick wit, he always had a nickname for everyone. Larger than life, Charlie will be deeply missed. Charles H Clark, of Three Rivers, MI passed away Wednesday, August 31, 2016 at the age of 89 in the comfort of his home with family by his side. Charlie was born on October 31, 1926 in Akron, OH. He was the son of Bracy and Lucretia (Troyer) Clark. Charlie served in the United States Navy during World War II. He married the love of his life, Norma, on September 16, 1947. 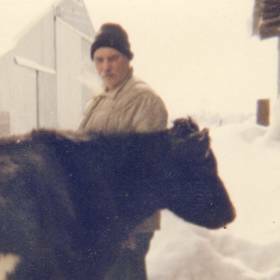 He worked for General Motors for 45 years until retirement in 1992 when he became a full time farmer. 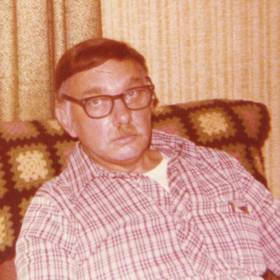 Charlie is survived by his children: Jean, Shirley, Charlene, and Pamela; his siblings: Harold, Lois, Wilma, Helen, and Darrel; 11 grandchildren; 24 great-grandchildren; and 6 great-great-grandchildren. He was preceded in death by his parents Bracy and Lucretia, his two brothers Loren, and David, his youngest daughter Janice and wife of 63 years Norma. The family will receive friends on Wednesday, September 7th from 4 to 7pm, at Life Story Funeral Home, 409 S. Main St. Vicksburg (269-649-1697). A funeral service will be held on Thursday September 8th at 11am at the same location, With Pastor Sam Maddox officiating. Burial will follow the service at Mint cemetery in Park Township. Memorial donations to the family would be appreciated in c/o Susana Magori. 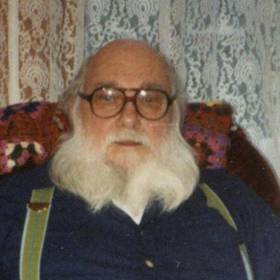 Please visit Charlies webpage at LifeStoryNet.com where you can read his life story, sign the guestbook, share a memory and/or photo.